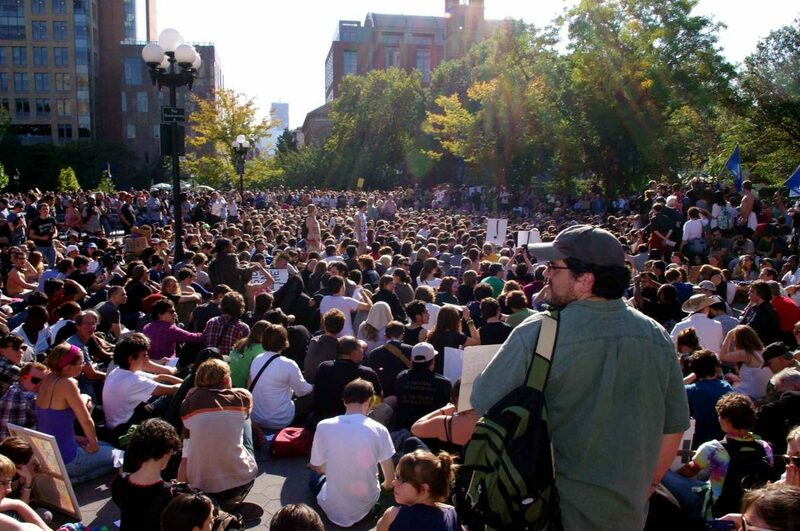 A General Assembly taking place in Washington Square Park (NYC) during the Occupy Wall Street protests of 2011. Participatory budgeting (PB) and workers cooperatives–two pillars of the solidarity economy–offer some of the best tools for building egalitarian, democratic political structures and a new kind of economy that works for everyone. PB humbly started in Porto Alegre in 1989 and has since inspired political movements across the globe, revolutionizing conceptions of the role of the citizenry in affecting everyday life. PB first arrived in America at Chicago’s 49th Ward and thereafter spread to New York City, Vallejo, California, and many other cities. It is important to note that when a citizenry gains the ability to democratically allocate funds, they grow increasingly excited about directing those funds to other participatory institutions, especially—as we shall see later—workers cooperatives. Those who want a more visual representation of this multi-step process can watch this Participatory Budgeting Project video. Additionally, workers cooperatives have the potential to democratize the ownership of the means of production. Historian and activist Gar Alperovitz defines workers cooperatives as “essentially a one-person one-vote, member-owned and -controlled economic institution or business… [that] differ[s] from many traditional businesses in [its] values and motives.” Because worker cooperative ownership is more egalitarian and spread out compared to the modern corporation, its shareholders have more of an incentive to account for things like community well-being and other externalities. Alperovitz further notes that collective ownership can also exist outside of explicit workers cooperatives. For instance, Employee Stock Ownership Plans (ESOP) can give employers tax incentives to facilitate worker buyouts of companies, and Community Land Trusts (CLTs) transfer ownership of land to affected communities—and by extension, community members—thereby slowing the process of or even preventing gentrification. PB and workers cooperatives have proven themselves capable of democratizing both decision-making and ownership, and it seems like these achievements would be celebrated by those dedicated to fighting for social justice. Yet, these institutions have not been wholeheartedly embraced by many on the Left. In fact, many prominent leftists—be they popular left-wing writers like Jacobin’s Bhaskar Sunkara or other orthodox Marxist academics more generally—condemn participatory budgeting and workers cooperatives as either unproductive or even petit-bourgeois and neoliberal. Such leftists critics usually have three basic arguments for condemning PB and workers cooperatives. Their first argument rests on the idea that organizing workers at the point of production is the most effective form of praxis. It deems organizing universities, urban centers, or housing complexes that do not manufacture “real” things as less effective tasks, especially when compared to organizing directly at the factory or place producing material things. The second argument states that the history of neoliberal elites coopting participatory budgeting to normalize neoliberalism belies its reactionary character and unworthiness. The third argument, employed by many orthodox Marxists especially, asserts that Karl Marx himself deemed workers cooperatives to be utterly futile forces of resistance in a capitalist economy. This article sets out to debunk these arguments and reveal them as emblematic of a strain of defeatism that has infected certain parts of the Left. It showcases modern cases of PB and workers cooperatives to reveal their inherent radical potential, their ability to withstand the influence of the neoliberal elite and avoid cooptation, and thus forge the path for a more equitable world. It also notes that even when PB is coopted by the state—because, after all, all sorts of radical ideas have been spoiled by neoliberalism—its inherent radicalism often lurks beneath and manages to challenge the conservatism being imposed on it. Before making these claims, however, it first explains these aforementioned Left critiques in order to better understand and challenge them. Yet, building stronger unions and a social democratic state—strategies we should all explicitly support—are by no means mutually exclusive with other types of political strategy. These views of PB and workers cooperatives fail to see the these two institutions first and foremost as tools that can improve governance. The question thus arises: What type of governance? If the Left chooses to retreat from trying to influence PB and workers cooperatives, they will be seized by the Right in its attempt to improve neoliberal governance. Conversely, if it chooses to engage with them, it can abide by the syndicalist vision of “forming the structure of the new society within the shell of the old.” Instead of succumbing to defeatism or inaction until the ever-vague ripening of “international conditions,” it can actively and immediately shape the world surrounding it. Neoliberals could support PB so long as they could also ensure that the process did not challenge free market governance or the structure of the economy. Thus, there have been notable cases where PB steering committees have selected ballot questions suited to the city’s political interests, thus proving the process not to be centered around unleashing direct democracy, but meeting predetermined, un-radical political goals (ex: short-term cosmetic neighborhood projects like update street lighting versus channeling money towards long-term workers cooperatives that could affect the ownership of the means of production). After visiting Porto Alegre, many leftists viewed PB as “part of a renewed leftist project, one that overcame the authoritarian limits of authoritarian and bureaucratic socialism… [and] showed that leftists could govern well, succeed electorally, and offer a compelling alternative to technocratic good governance based… on social justice principles.” Yet, neoliberals continued to adapt it as well. In Venezuela, PB was adopted as national policy by Chavez’s government and simultaneously sponsored by the anti-Bolivarian USAID organization operating within the very same country. Similarly, while the new Left wing Portuguese government was sponsoring a national PB in the 1990s, the World Bank and other US-backed NGOs were spreading it throughout countries in the developing world. Thus, we can immediately see PB as a governance tool being used by vastly different political parties for vastly different political goals. The aforementioned argument that Karl Marx did not champion workers cooperatives or see them as a progressive force is simply false. Nathan Cedric Tankus, economic researcher at the Modern Money Network, cites a passage from Capital Volume III as being particularly representative of Marx’s pro-cooperative opinions. In this passage, Marx excitedly writes that “the cooperative factories run by workers themselves are, within the old form, the first examples of the emergence of a new form.” These new forms could eventually transform society “on a more or less national scale,” even if the workers served as “their own capitalist.” Additionally, when addressing the First International, Marx unequivocally states that “the value of these great [cooperative] experiments cannot be overrated” and defines them as a “victory of the political economy of labor over the political economy of property.” In these specific cases, Marx’s support for workers cooperatives is unambiguous. Sean Keith recently completed his second year at Northeastern University as a BA-MA combined History student with a minor in Chinese. His areas of academic interest are America and China, and he is specifically interested in labor history, economic history, political economy, and the history of social movements. He is a proud member of Northeastern’s Students for Justice in Palestine (SJP) and is on the organizing committee for the newly formed Democratic Socialists of America Libertarian Socialist Caucus (DSA-LSC). “What is participatory budgeting?,” The Participatory Budgeting Project, last accessed on July 25th, 2017, https://www.participatorybudgeting.org/what-is-pb/. Gianpaolo Baiocchi and Ernesto Ganuza, Popular Democracy: The Paradox of Participation (Stanford: Stanford University Press, 2017), 75. Benjamin Goldfrank, “The World Bank and the Globalization of Participatory Budgeting,” Journal of Public Deliberation, 8.2 (December 2012): 1-14. Bhaskar Sunkara, “Bhaskar Sunkara’s AMA, Saturday January 7th, 2017: Question thread!,” Reddit.com, https://www.reddit.com. Isaac Deutscher, interview by Eric Davis, Allan Whiteman, Gary Wurtzel and Melvin Leiman, “Marxism and the New Left,” Marxists.org, https://www.marxists.org. Peter Lang and Craig Phelan., ed., Trade Unionism Since 1945: Towards a Global History, Volume 2 (Bern: International Academic Publishers, 2009), 323. Steve Breyman, Why Movements Matter: The West German Peace Movement and U.S. Arms Control Policy (Albany: State University of New York Press, 2001), 214. John Reimann, “Comment section response to ‘Parsing Out the Legacy of Sewer Socialism: The Municipal, Rebel City Movement in the Age of Trump Has A Precedent,’” The North Star, http://www.thenorthstar.info. Bhaskar Sunkara, “The ‘Anarcho-Liberal,’” Dissent Magazine, September 27th, 2011, https://www.dissentmagazine.org. “IWW official preamble,” Industrial Workers of the World (IWW), last accessed May 29th, 2017, http://www.iww.org. José Eduardo Utzig, “Participatory budgeting of Porto Alegre: a discussion in the light of the principle of democratic legitimacy and of the criterion of governance performance,” The World Bank, last accessed May 29th, 2017, http://siteresources.worldbank.org. Steven Hirsch and Lucien van der Walt, Anarchism and Syndicalism in the Colonial and Postcolonial World, 1870–1940 The Praxis of National Liberation, Internationalism, and Social Revolution (Leiden: Brill Publishers, 2010), 380. Giovanni Allegretti and Sofia Antunes, “The Lisbon Participatory Budget: results and perspectives on an experience in slow but continuous transformation,” Field Actions Science Reports, The journal of field action, 11.1 (October 2014): 1-10. Baiocchi and Ganuza, Popular Democracy, 68. Simon O’Meally, “The Contradictions of Pro-poor Participation and Empowerment: The World Bank in East Africa,” Development and Change, 45.6 (November 2014): 1248–1283. Fred Moseley, ed., Marx’s Economic Manuscript of 1864-1865 (Leiden: Brill Publishers, 2010), 538-539. Micheline Ishay, ed., The Human Rights Reader: Major Political Essays, Speeches and Documents From Ancient Times to the Present 2nd Edition (New York: Routledge Taylor & Francis Group, 2007), 256. Ginia Bellafante, “Participatory Budgeting Opens Up Voting to the Disenfranchised and Denied,” New York Times, April 17th, 2015, https://www.nytimes.com. Pamela Wilcox, Neil Quisenberry, Debra T. Cabrera, and Shayne Jones, “Busy Places and Broken Windows? Toward Defining the Role of Physical Structure and Process in Community Crime Models,” The Sociological Quarterly, 45.2 (March 2004): 185-207. Ali Kucukgocmen, “Queens Students And Parents Will Decide How To Spend Funding For School Improvement,” Queens Patch, March 14th, 2017, https://patch.com/. “Meet Your Ballot,” New York City Councilmember Brad Lander, last accessed May 29th, 2017, http://bradlander.nyc. “Platform,” The Movement For Black Lives, last accessed May 29th, 2017, https://policy.m4bl.org. Nicole Gelinas, “Why New York City’s ‘participatory democracy’ is a sham,” New York Post, April 2nd, 2017, http://nypost.com. E.P Thompson, “The Point of Production,” New Left Review, 1.1 (January-February 1960): https://newleftreview.org.